Eastwood is a complex of 51 houses with accommodation for 632 first-year undergraduate students. Houses are shared by between 11 and 13 students, creating a homely feel and a friendly community. Eastwood is our affordable accommodation option, with shared rooms starting from £70 a week. It is on the east side of campus, a five-minute walk to the Library and Students' Union. To make you feel safe and at home, Eastwood has a secure living environment, with swipe card access to the buildings. There's also secure bike storage available. Eastwood has communal toilets and bathrooms, shared by around six students. All of our University accommodation is smoke free. How much it costs to live in Eastwood from 2019 to 2020. A standard bedroom with a washbasin in Eastwood 32 to 51 costs £136 a week. This is £5,168 for the full 38 week contract. A standard refurbished bedroom in Eastwood 22 to 23 costs £136 a week. A standard bedroom in Eastwood 24 to 31 costs £133 a week. This is £5,054 for the full 38 week contract. A standard bedroom in Eastwood 1 to 21 costs £113 a week. This is £4,180 for the full 38 week contract. A shared bedroom in Eastwood 1 to 19 costs £70 a week. This is £2,660 for the full 38 week contract. View two bedrooms and a kitchen in Eastwood in 360 degrees. The bedrooms in Eastwood give you everything you need to work, relax and rest. All rooms have use of communal showers and toilets. 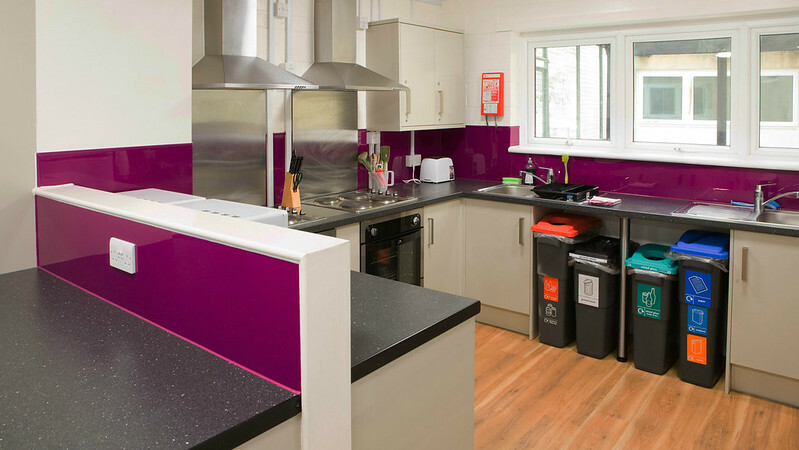 Each house has a large communal kitchen, perfect for cooking meals and socialising with your flatmates. 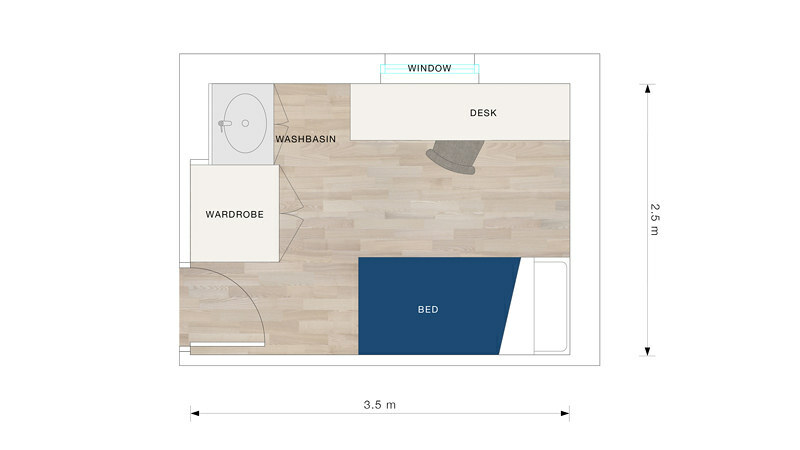 A typical floor plan for a standard bedroom in Eastwood with a washbasin. This is an example, not all bedrooms are exactly the same. Eastwood is made up of 51 houses with three floors in each. There are between 11 and 13 bedrooms in each house. Your room details contain your house and room number. For example, the room number E25.05 means you are located in Eastwood house number 25, room five. There is no accessible accommodation for students with disabilities in the Eastwood complex. 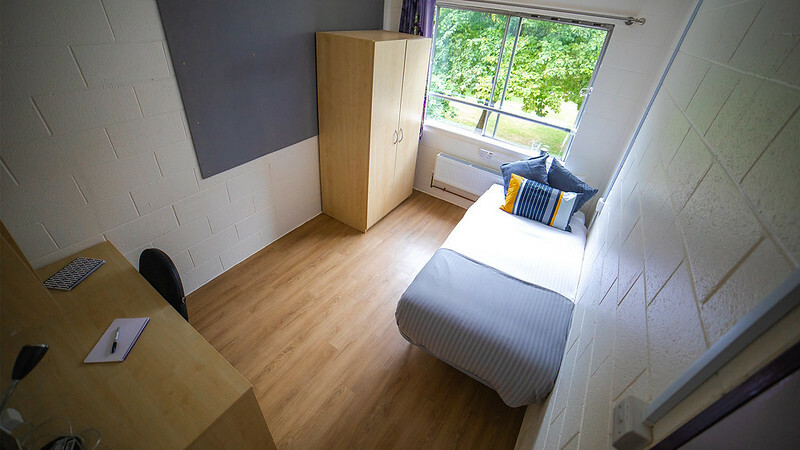 If you have a disability or additional needs, you can choose to live in one of the specially adapted bedrooms in our on-campus accommodation. The items and services that come as part of the price of your accommodation. Cleaning of some areas in houses 24 to 51. There is no cleaning service in houses 1 to 23. You are responsible for keeping your rooms clean and tidy. You can buy extra cleaning services for your bedroom, bathroom and kitchen. At the start of the academic year you can elect a Hall Representative. The Students’ Union supports Hall Representatives to organise social and community-building events. Hall Representatives collect student feedback about living in the accommodation. They discuss this with the University and the Students’ Union to make sure your voices are heard. What it's like living in Eastwood accommodation from University of Bath on Vimeo.